Best Camino Tour Company - Small groups & the most lovely walks! Marly Camino is a local Spanish company based in Madrid, formed by a dedicated group of passionate, high-quality, professional human beings that are in love with our home. For over 10 years, we have been taking small groups off the beaten path to discover our favorite natural and cultural gems, along with the Camino de Santiago, and many other spectacular walking routes in Spain and Portugal. Among our most valuable assets are the hospitality and the personal treatment you will receive. We carefully curate every part of your journey, to make it a truly ‘Marly’ quality experience. We take care of you with warmth and professionalism, because our pilgrims are our most valuable asset. With us, you are like family. We take care of every detail, so you don’t have to worry about a thing and can fully enjoy everything the route has to offer. We want to help you make the most of your time here and with us! We believe in creating life experiences. And we believe this is much more than just a walk. We guarantee our carefully curated routes, our direct and personal treatment and our attention to detail will make each one of our ‘Caminos’ are unforgettable. We respect and value everyone’s reasons for wanting to do the walk, and give you all the support so that each person finds what he or she is looking for. And hopefully even a little more than that. We take pride in our quality service, our exclusive routes and, our very happy pilgrims that have helped us become the top-rated agency we are today. Thank you, we hope to see you soon! If you want to know more about Marly’s story click here: The story of Marly Camino. Our founder's name is Ligia Margarita Muci Ramos but she is known to her family and friends as Marly. She did her first Camino in April 2004 while she was living in the United States. Her pilgrimage meant so much to her and helped her so much that she did not think twice about giving her life a change and moving to Madrid in October that very year. In 2006 she founded her first company, originally called "Marly Tours" where she initially offered just one Camino de Santiago tour per year. Since the company specialized only on the Camino de Santiago and walks through the peninsula, now Marly Camino. For Marly, the Camino was something that marked a before and after in her life. This is why she wishes to transmit the virtues that the Camino offers us through Marly Camino so that pilgrims have a Camino experience that is as transformational to them as it was for her. Her deepest wish is to offer the opportunity of living this internal journey and show that, if we are willing and have an open heart, we can achieve major changes in our lives. From the inception of Marly Camino, she has made every effort to achieve this. With the invaluable help of her daughter Samantha, Marly Camino has created an amazing team that continues to grow and develop into a beautiful project that shows a different way of sharing the experiences that are lived on the Camino and everything it has to offer: a search within, an inner joy and a school of life. Every person on our team reflects our kindness, humanity, and passion for everything we do. We are Camino de Santiago specialists. We offer all the necessary support for you to have a magnificent Camino experience. Our warm, professional attention to detail and love will make you feel you've known us always. We are dedicated to making your experience unforgettable. With us, you are like family. And we mean it! We carefully hand pick our accommodations for the best possible experience! Our close relations with accommodation owners and managers, whether it's small 5-bedroom B&B's, to Paradores or charming 5-star hotels ensures you feel right at home. Gastronomy is a key part of the experience, enjoying & discovering local specialties. You'll think "how haven’t I tried this before?" The Marly Olé Project. We Create Experiences That are Different. After 10 years of organizing the finest walking tours in Spain, we now are proud to introduce Marly Olé to the World. With this new project, we seek to offer the same “Marly quality” for anyone seeking unique experiences in Spain, Portugal and all over the Iberian Peninsula. Our objective? To create an experience that will live in your heart forever. Our only goal is that, when you have to leave, you already want to come back. We offer more than ten journeys along four of the most popular Camino routes: The French, Portuguese, Northern and Andalusian Ways. We also offer other walking journeys such as the Ignatian Way and the Lourdes Way. We offer unique tours along all of these routes that enrich the spirituality of the Camino with cultural, culinary and cultural experiences in each of the regions we visit. Our impeccable organization and our warm and professional staff offer our Pilgrims a highly personalized service. 20 reasons to choose Marly Camino! Specialized in the Camino de Santiago! The knowledge, experience, and enthusiasm of our team. We love and really feel the Camino and it shows! The exclusivity: Guaranteed quality and warmth, with beautiful and unique accommodations. You walk at your own speed. We give you a backpack, hat, Pilgrim’s passport and shell, foot cream, notepad, route map & more! Assistance during the entire way for any unforeseen circumstances, either from our guides or from the office. We cover the tiniest, most minute details. You have to experience it to believe it. All of our trips start in a main city, with easy access by plane or train. Most of our Camino de Santiago journeys offer the possibility of receiving the Compostela certificate. We are Camino de Santiago specialists! We have different routes: French, Portuguese, North, Andalusian and Catalonian Way. We share reflections each day that will help you understand the true meaning of the Camino. We include health insurance for the duration of our signature guided trip for your peace of mind as you walk. We include guided visits in main cities to complement your Camino experience. Breakfasts and dinners are included with typical cuisine and wine from each region in our guided Caminos. After our guided trips, you get all the pictures sent to you when you're done! We guarantee, whenever possible, the Botafumeiro (Censer) ritual at the Santiago Cathedral! The fantastic price-quality relation for everything that is included in our trips! Your Camino ends with an unforgettable dinner surprise in our guided trips. All the love and passion we put into our work for you to have the best experience! You will feel as if you have known us for a lifetime. Our priority is to establish a relationship of trust with our clients. 1. Working with us gives you absolute peace of mind as we are an official Spanish Travel Agency registered to Spain’s General Tourism Board with license number CICMA 3031, which guarantees the fulfillment of our obligations to our clients. 2. We were awarded the Tripadvisor certificate of Excellence in 2016, 2017, and we repeat in 2018 for our continued quality service. 4. Our website is verified by the Chamber Trust seal. This provides our clients the knowledge that our website is recognized internationally as a secure site. 5. We also offer an easy and secure online payment method with the Paypal platform. 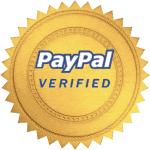 Paypal offers protection, safety and efficiency for our clients’ payments, allowing them to pay with their debit or credit card as well as their personal Paypal accounts.